Gurgaon, India Vihaan Networks Limited (VNL) announces successful completion of the world’s largest solar-powered mobile network installation impacting 18 million citizens in 22,688 villages in record time. Keeping in mind the difficult terrain, absence of roads, electricity and other infrastructure, we have deployed solar technology to power all equipment on the towers, making this the largest green mobile network anywhere in the world. “The Government of India has completed roll out of a telecom network in areas worst affected by left-wing extremism across ten states in record time as part of a major initiative to boost development in the Red Corridor,” Communication Minister Shri Manoj Sinha said, honoring Vihaan Networks Limited (VNL) with a plaque and completion certificate to commemorate the milestone. Working with BSNL, VNL set up the lion’s share of the world’s largest solar-powered green mobile network in LWE affected regions using indigenously designed and manufactured technology in a record time of less than 18 months and is now operating and managing it for a period of 5 years. The Public-Private Partnership project was completed in the face of enormous risks and represents a success story of true grit and perseverance. The project is part of the Pragati Programme of Prime Minister Shri Narendra Modi and has been actively pushed by the Home Ministry. 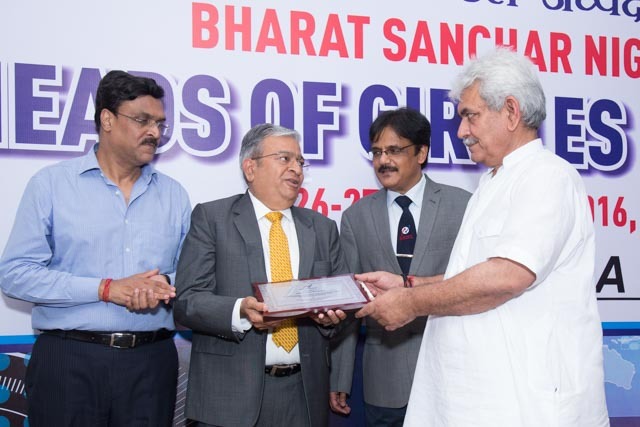 On the occasion of Head of Circles Conference organized by BSNL, Honourable Minister of State, Ministry of Communications, Shri Manoj Sinha, felicitated VNL Founder and Chairman Shri Rajiv Mehrotra for the timely and efficient execution of the project. The Minister also urged the domestic telecom industry to invest in research and development and innovative technology to produce world-class products for achieving the Prime Minister’s vision of a Digital India. As a consequence of this project, a whole new world is opening up for citizens in the Red Corridor. Communicating with family, friends, employers and associates is now possible. Information related to agricultural inputs and markets is now available. Banking and other commercial activities are now accessible. Emergency and other health services are within reach. Governance is easier and more interactive. Vihaan Networks Ltd. (VNL) specializes in the design and manufacture of telecom equipment. Driven by a vision of connecting the underserved, VNL’s innovative solutions in wireless communications let users set up mobile networks, get connected, and become empowered. The company’s end-to-end systems are easy-to-use, environment friendly, reliable, and affordable, and have been deployed in numerous locations across the world, in Latin America, Africa and Asia. With more than 35 years of experience and expertise in telecommunications, VNL also offers security and strategic communications solutions for military and disaster management applications as well as a wide range of industrial and civil application scenarios. VNL is the first Indian company to realize the potential of research and development of telecom technology, creating new benchmarks in telecom innovations at its Design Centre at Gurgaon.